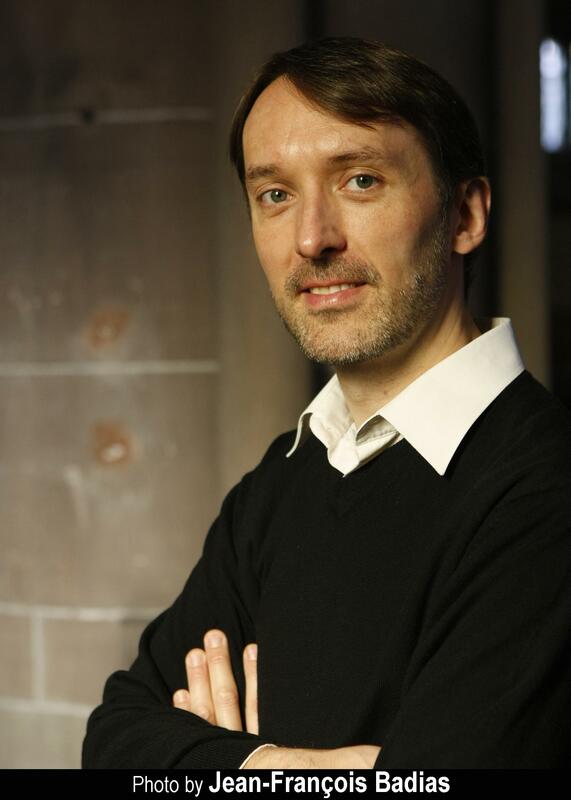 French organist Olivier Latry is one of the most distinguished concert organists in the world today. One of three titular organists at the Cathedral of Notre-Dame in Paris, he is also Professor of Organ at the Paris Conservatory of Music, Organist Emeritus with the Montreal Symphony Orchestra in Canada, and maintains a full schedule of concert performances appearing regularly as a soloist at prestigious venues and festivals, and with leading orchestras around the world. Mr. Latry was born in Boulogne-sur-Mer, France, in 1962 where he began his musical studies. He later attended the Academy of Music at St. Maur-des-Fossés, studying organ with Gaston Litaize. From 1981 to 1985 he was titular organist of Meaux Cathedral, and at the age of 23 won the competition to become one of the three titular organists of the Cathedral of Notre-Dame in Paris along with Philippe Lefebvre and Jean-Pierre Leguay; the three of them succeeding Pierre Cochereau. In 1990 he succeeded his teacher, Gaston Litaize, as organ professor at the Academy of Music at St. Maur-des-Fossés, and then subsequently in 1995 was appointed Professor of Organ at the Paris Conservatory where he continues to teach today along with his distinguished colleague, Michel Bouvard. Having performed in more than fifty countries on five continents, Mr. Latry does not want to specialize in any specific repertoire, but rather wishes to explore all styles of organ music, as well as the art of improvisation. In 2000, to celebrate Olivier Messiaen as one of the greatest composers of the 20th century, he performed three complete cycles (six recitals each) of Messiaen’s organ music, at the Cathedral of Notre-Dame in Paris, the Church of St. Ignatius Loyola in New York City and St. Paul’s Cathedral in London. Mr. Latry has also inaugurated many significant concert hall organs around the world, including Verizon Hall (Philadelphia USA), The Palace of the Arts (Budapest, Hungary), and The Musikverein (Vienna, Austria). In 2014 he performed the inaugural concerts at La Maison Symphonique (Montréal, Canada) and a concert as part of the inaugural concert series at the Royal Festival Hall in London (UK). In addition to concerts and teaching, Mr. Latry has made his mark through many recordings on the BNL label featuring music of Bach, Widor’s Symphonies 5 and 6, Vierne’s Symphonies 2 and 3 and the complete works of Duruflé. With Deutsche Grammophon he has recorded a transcription disc entitled “Midnight at Notre-Dame”, a disc featuring the organ works of César Franck, and the complete organ works of Olivier Messiaen. He has also recorded the Poulenc Concerto and the Barber Toccata Festiva with the Philadelphia Orchestra, and the Jongen Symphonie Concertante with the Liège Orchestra. His most recent recording on the Naïve label is entitled “Trois Siècles d’Orgue Notre-Dame de Paris” which features music composed by past and current organists of Notre-Dame Cathedral. In recognition of his distinguished work in the field of organ performance and teaching, Mr. Latry has received many prestigious awards and honorary degrees including the Prix de la Fondation Cino et Simone Del Duca (Institut de France–Académie des Beaux-Arts) in 2000, and “Honoris Causa” Fellowships from the North and Midlands School of Music (UK) in 2006, and from the Royal College of Organists (UK) in 2007. He was also presented the International Performer of the Year award by the New York City chapter of the American Guild of Organists in April 2009, and received an honorary Doctor of Music degree from McGill University in Montreal Canada in 2010.